How do I love thee, PC building? Let me count the ways. You're fun, rewarding, challenging (at first, perhaps), and ultimately you help keep money in my pocket. But money is usually the problem with cobbling a gaming rig together, isn't it? Your budget is the judge and jury, keeping you from that GTX 770, $200 motherboard, or diamond-encrusted Gordon Freeman profile you want on your case door. Starting, well, today, we're going to try and post one PC build every month on The Escapist. The specifics of each build will vary, and this month I'm focusing on the low end: the almighty $750 budget build. How far can we get $750 to go? Pretty far, in fact. I managed to keep within the $750 budget while nabbing a six-core CPU, decent discrete graphics, a solid state drive, and Windows 8.1. The only gear not included in the price is a monitor and peripherals. One final important note: Part prices change literally every day, so there's a chance parts could be a few sheckles more (or less) once this post is live. If you're spending less than $200 on a CPU or APU, AMD definitely rules the roost. Intel has some compelling offerings in its Pentium and Core i3 lines, but how can you say no to a six-core CPU running at 3.5 GHz? The FX-6300 CPU is exactly that, complete with a 95W TDP, a 4.1 GHz Turbo clock, and 8 MB of L3 cache. It's not the latest and greatest (if you're expecting that in a $750 build, let me show you to the door, sir or madam), but it needs less than 100W to run, and it will keep up with any game you'll be playing on the PC. Tom's Hardware has the FX-6300 listed as their best gaming CPU for $120, too. And for those who need a CPU that can flex its muscle outside of the gaming universe, the 6300's six cores are very multi-thread-friendly. That should keep the Photoshop crowd happy, I think. To keep the budget on track, I'm not including a third-party CPU cooler. 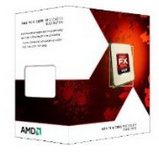 The one included in the box by AMD should do just fine, unless you want to do some serious overclocking. When building a PC on a limited budget, the motherboard is where you'll often see the most sacrifices...but that doesn't mean you're going to get stuck with a lemon. MSI has stepped up its motherboard game tremendously in the last two years or so, and the 970A-G43 is hard to beat at $70. 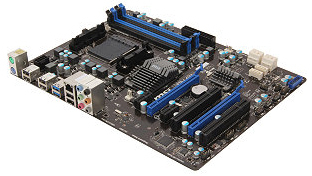 The 970A-G43 is a Socket AM3+ motherboard, which is exactly what we need for our FX-6300. No Thunderbolt or PCI Express 3.0 means it's not the most future-friendly motherboard on the planet, but it has UEFI BIOS, two USB 3.0 ports on the back (along with USB 2.0, 8-channel audio, Ethernet and PS/2), and a USB 3.0 header below the RAM slots for 3.0 ports on the front of your case. Six SATA 6 Gbps ports are enough for our two storage drives and optical drive, with pots leftover for later expansion, and RAID is supported on-board. The 970A-G43 is going to accomplish exactly what it needs to: Boot, run all the chosen hardware, and hopefully stay alive and kicking for three or four years. It's a budget board, through and through, but it's one of the best around.